One of the pleasures of going on holiday by the seaside is being able to cool off with a refreshing dip in the waves. 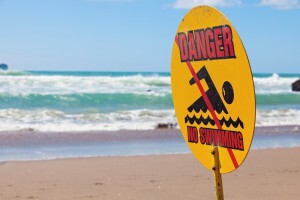 However, as with everything, there are some dangers associated with water, and we are not just talking about drowning! 1) Do not swim after a heavy meal, or if you have had a few glasses of beer or wine, as the cold water can cause muscles to cramp. Not only is this painful it can be fatal if you cannot touch the bottom! As a general rule you should not swim for an hour after eating. 2) If you are not a regular swimmer, you should always try and stay within your depth – distances are perceptive when you are in the water, and the shoreline will not be as close as you might think it is. 3) Airbeds, and inflatable dinghies and crocodiles etc. are great fun, but remember that they are easily caught by the wind, and you can be swiftly blown out to sea if you are not careful. 5) Snorkelling is great fun too, but remember to wear a T shirt because you back will be exposed to the sun all the time. 6) Keep an eye open for water skiers and jet skiers, and stay out of any cordoned off areas, as they will not be able to see you in the water. 7) Do not swim if the red flags are up. 8) One other tip when on the beach, is to leave your valuables safely locked away in your holiday accommodation, do not leave them unattended whilst swimming or entrust them to a stranger. 9) Most importantly remember to buy travel insurance.